Paddy Power Poker is one of Europe’s finest poker rooms, boasting a great bonus offer, lots of traffic, great support, and smooth-running software. At PaddyPower you will find a large range of stakes and games. From $2 tables all the way to $300/$600, they offer a large variety of game types including: LHE, NLHE, Pot-limit Omaha, Limit Omaha, Limit Omaha Hi/Lo, Pot-limit Omaha Hi/Lo, and 5/7-Card Stud. You can play heads-up games, 6-max and 10-handed Full-Ring. Novices and professionals alike trust their bankrolls to Paddy Poker. 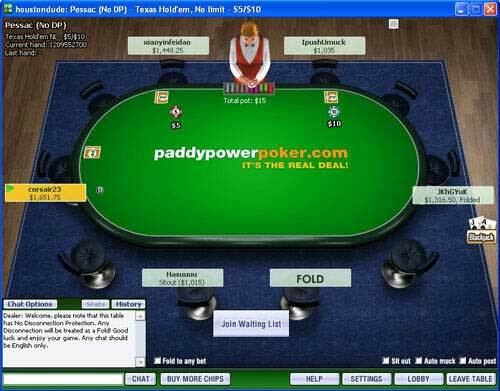 Paddy Poker hosts one of online poker’s most successful tournament series: the European Championship of Online Poker, which is in its 3rd running. With tournament buy-ins ranging from 50 cents to $2500, PaddyPoker has something on offer for bankrolls of all sizes. SNG’s also run from 10 cents to $1000, offering many different formats: Turbo, Double Stacks, Double-or-Nothing, and regular. They are quite popular on this site. As you can see, it all depends on your VIP level. You will also earn from 20 to 40 points for every $1 in tournament/SNG fee you pay, depending on your VIP level. You can use these points to enter into tournaments or to buy prizes from the Points-for-Prizes Store. From iPod’s to laptops, DVDs to Playstations, if you want it, chances are that PaddyPoker will have it in their VIP Rewards Store. 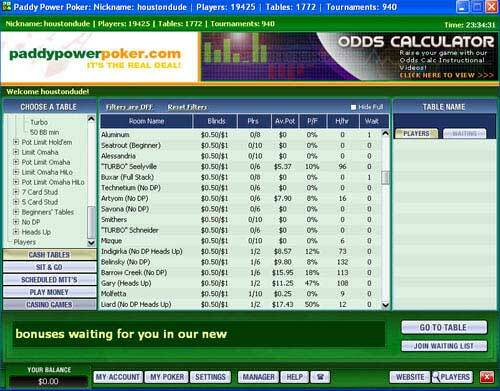 Paddy Power Poker’s software is quite easy to use and navigate. The left side of the lobby screen contains all of the games separated into categories. This is very helpful if you are looking to just play one level of the same game; allowing you to look solely at these games. Each table listed is accompanied by the number of players, average pot size, average number of players seeing the flop, hands played per hour, and a waitlist. All of these numbers come in handy if you are one who likes to table select for fishier opponents. There are many options one can set in the “Settings” tab, including choosing an avatar, auto-login, 4-color deck, show folded cards, and audio settings. You can also select ‘mini-table view’ which allows you to multi-table without overlap. The betting-slider allows you to select many betting options, including pot-sized bets and all-in wagers. There is also a stats tab which tracks a lot of important information on your game including % of flops seen, actions taken (fold, check, call, raise, etc…) and pots won. There is plenty of available action at Paddy Power Poker, especially on the weekends. Being part of the iPoker network allows them to maintain a stable player base and a constant influx of poor poker players. SNG’s do take more time than some of the bigger sites to get going, however most stakes do run constantly. The low-to-mid stakes run all the time, offering any SNG grinder a nice site to build their bankroll. There are plenty of fish to be found on Paddy Power Poker. With a European player base and the backing of the iPoker Network, it is easy to find bad players at all games and stakes. Players should be able to start and build a bankroll on PaddyPoker and, with increasing traffic, should be able to move through the limits on their way to making large amounts of money. Paddy Power Poker offers a great bonus: 100% deposit bonus up to $500. This means if you deposit $400 you can eventually earn another $400 in bonus money after accumulating enough ‘Power Points’. There’s no need to fiddle around with bonus codes; simply sign up for your account using FTR’s links and make your qualifying deposit to receive your bonus! The Paddy Power Poker bonus clears in increments of $5 for every 334 Power Points that are earned. The bonus does take some time to clear. However, with determination, you will move through some of their VIP Levels while you clear it, allowing you to accumulate points more quickly. In the end you will finish with a high VIP level that will benefit you the most in the long run. (See above for information on VIP Program.) You’ll have 90 days from the time you deposit to accrue as many Power Points as you can to unlock the bonus funds. Deposit bonuses are great, but the bonus is only the beginning of the rewards available at Paddy Power Poker. You’ll get $5 for free, even without making a deposit, to try out the poker games at Paddy Power. You’ll also be able to check out the casino games with $5 free for use in the casino. Finally, you’ll receive four tokens to the weekly $250 First Depositors Freeroll. You’ll be accumulating a ton of Power Points as you clear your bonus, and they’ll contribute towards raising your status in the “VIP Rewards” program. Everyone starts as a POWER ONE player, but through diligent play, you can work your way up to MAX+ POWER status. This program allows you to receive milestone prizes, cash freerolls, wonderful shop merchandise, and more. At the highest level, players get invitations to exclusive events and the opportunity to trade points in for bonuses of up to $25,000! Click here to join Paddy Power Poker! One of the nicer features of the site is the built-in “Manager” button on the lobby page. This allows any player to immediately connect to a customer service employee who will do their best to answer any question and/or concerns. They also have a 24-hour customer service phone line for all locations. Ireland: 1800 924 406, UK: 08000292497, and for everyone else: +353 1 4881750.<br. You can also email support at poker@paddypower.com.